I needed just a small space to store some things on a short term basis. This was the perfect location. I was showed the space that I could (or maybe should) rent based on needs I explained. Very accommodating all the way around. This location was 40 minutes away. Your closest location was all booked. I felt very comfortable leaving all my worldly possessions in your care for over a year. The office manager, Marsha, was always courteous and helpful when needed. I would use you again and would refer you to my friends. Perfectly satisfied with C'ville storage at Crozet. Staff was professional and considerate. Thank you! Best storage solution in Crozet area! Clean & well-maintained! Units are clean and well-maintained. Very nice location, not hiding in some back lot in the woods. Best storage facility in Crozet area. Rates are fair. Great place to deal with. Marsha was very friendly and very helpful. I stored my travel trailer there for two years. It was bug-free, critter-free and the management would always call me for problems, like when my RV cover blew apart in the wind... It's pricey, but so are all of the options in the area and there is never enough space to accommodate needs for the number of RV's in the Charlottesville area. Only left because I sold my trailer. Used facility for about 10 months. Staff are friendly and helpful. Facility is clean, safe and well lighted. Provided a place to store "stuff" while we were settling into the Lodge at Old Trail. Clean, well-kept facility and friendly staff! Great place! I was impressed by the top-notch condition of this storage facility. It was very well-kept, very clean, and security was excellent. Staff are very helpful and friendly. I also appreciated the option for a mid-month move in. Some places charge you for the full month even if you move items in on the 12th, etc. - this place does not! The best self storage company in every way! We could not have so easily completed our move without this very clean, temperature controlled, and secure space to house our treasures. Thank you, Marsha, for the best experience! Had to use for 9 years- very good storage units and very clean facility. Great customer service and quality units! Yes! I would highly recommend this facility to a friend! Marsha was really great to work with. Explained everything slowly and clearly and was very friendly and pleasant. Would definitely recommend this business to others. This is the second time that I have used Charlottesville Self Storage at Crozet, but the first time for personal use. Marcia was so easy to work with and made me feel at 'Home' right away! Thanks so much for always picking up the phone and helping with EVERYTHING! The facility is convenient and the customer service is exceptional. This was a great storage facility. Marsha made it very easy to obtain the storage unit and also close out when the time came. Clean facility with friendly professional staff. Will use again. 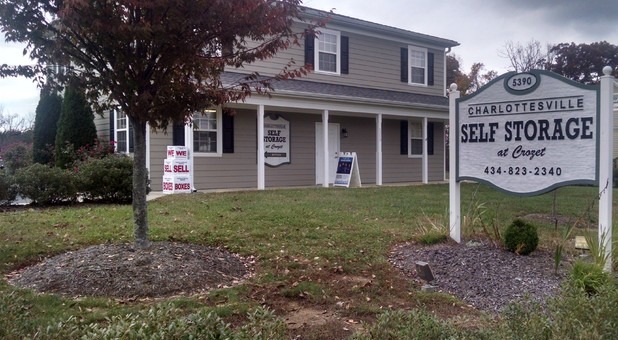 Our experience with Charlottesville Self Storage at Crozet was amazing. The items we stored stayed in perfect condition. Everyone one on staff was friendly and helpful. Their communication with us was first rate. I would not hesitate to use this facility again. Miss Marsha was so helpful when we needed an RV storage lot & unit during a move from NOVA - she could not have been more helpful and courteous - a very nice experience operated very efficiently. Marsha does a first rate job managing this facility. She is personable, reliable and a pleasure to do business with. She has made my experience with Charlottesville Self Storage at Crozet totally worthwhile. This is the second period that we have used the Crozet Facility. The experience starts with the Front Desk/Facility manager. Most welcoming and helpful to her customers. The facility is maintained spotless and the climate control is perfect. Their carts are great for moving storage items from your vehicle to your unit. Very convenient to residents residing in Crozet and Western Albemarle County areas. The manager is exceptionally helpful. We had to store our furniture between homes for three months. This required three 10'x15' lockers. They were clean and well climate controlled. Marsha helped us obtain the lockers in an economic manner and guided us through the process. We had access to our lockers and added to them regularly. Over all we were well served at a needful time. Very clean. Helpful and friendly staff. Customer service couldn't be any clearer or better!! Majority of the time I called or stopped by it was always the same quality of service, help, and caring. I feel like I was taken care of by Charlottesville city storage at Crozet. I appreciate everything that has been done for me. This facility is well managed by a staff that understands customer service and delivers it consistently. Access is easy and quality of buildings is super. The experience at Charlottesville Self Storage at Crozet was exceptional! From the Front Desk Manager's professionalism to the well kept storage units, this is the best place to go. Convenient, clean, & secure! Would highly recommend this business for your storage needs. Always clean and dry inside. Easy access, very secure. I've had a number of storage units and this is the best! clean, easily accessible, well maintained, and friendly service. a great option! Great facility. Convenient and clean. I had a particularly great experience with customer service. Kind and helpful! Highly recommend! Yes this is an excellent facility. We really liked this facility. The staff was wonderful and very helpful. The structure for payment was easy. The location was great. CSS @ Crozet has been a tremendous help over the past several years that I've had a unit. Always willing to help, and easy to reach and pay, CSS @ Crozet has a professional staff with very modern and clean units. Highly recommend! Best storage experience I've ever had. Great job! Great customer service. Stored my belongings for more than 8yrs without any problems. We would recommend this company to any and all. We have been renting for many years and could not be more pleased. Our business has been sold therefore we are no longer in need of storage. Very clean, secure and well maintained facility. I only needed the unit for a few months. They were very courteous when I needed to cancel and worked with me to quickly close out on my contract so I wasn't charged another month. They clearly had my best interest in mind. I definitely will use them again in the future. This is the nicest, cleanest facility I have ever rented. A friend pointed me to this storage facility and having looked at others, I was instantly stuck by its neatness, efficiency, and personalized service. My unit was fresh, with no signs of water (or any other kind of) damage, and moving my "things" in and out was simple (easy access; the provision of a clean, rolling cart; etc.). I would highly recommend this self storage facility--actually, I recommended it to my mother, who is now also a customer. Staff is excellent and accommodating. They were very easy to work with as I downsized my storage unit 3 times. Grounds and storage units are immaculate. Very professional and helpful. Clean storage units. No rodents as we have seen at other facilities. Very pleased! I went in about a week ago to ask for a storage unit and was very impressed with how organized they are! A neat, clean place to store your things. Staff was exceptional, always friendly and polite. Clean, friendly and honest.....if I only had one complaint, it would be that I wish they would have prorated our last month or given us at least 2 days grace period. We moved 2 days after our bill was due, so had to pay for an entire extra month. Otherwise GREAT! Great place and excellent customer service! Overall, I was very pleased with the service and state of the facilities. I would highly recommend them. I would recommend Charlottesville Self-Stroage at Crozet to ANYONE! From the moment I first contacted them, I new this was the right place. The storage facility is excellently maintained, always clean, always safe, and Marsha is always available to help and answer questions. The pricing is perfect - you definitely get your money's worth. I have stored in many places, but this is the first place where I truly felt like I did not have to worry about anything! The facility is immaculate! Marsha is professional, friendly, supportive, knowledgeable, helpful, and diligent. I would give them 10-stars if I could! I'm an undergrad student at UVA and was really worried about finding a decent and affordable storage option for the summer, but Charlottesville Self Storage at Crozet went above and beyond my expectations! I definitely think the amazing owners are to thank. Mrs. Marsha was so kind and helpful and really made the process as stress-free as possible. This business offers clean and modern facilities, wonderful customer service, and a beautiful setting. What more can you ask for? I give them the highest recommendation and will definitely use them again in the future! This storage facility has 24 hour gated access, so one's possessions are quite secure. The manager is very pleasant and efficient. The storage units are in great shape! There is ample parking space by each unit for loading and unloading. I would definitely use this facility again if I needed storage! Great self storage facility. Clean units. The staff was very friendly. I had a very pleasant experience working with Marsha and her associates. Awesome place to store your belongings. You can trust that even your most prized possessions will be safe. A beautiful grounds so need and clean. Those pine trees make me feel like I'm in Yuscany Italy. I would totally recommend your business. LOVE your head lady there very professional and obliging. Great lady!!!! Nice and clean facility, friendly and helpful manager, nice pricing! Excellent service from Resident Manager Marsha! Nicely maintained storage grounds, secured enclosed property, new and very clean storage units, and so close to UVA in Charlottesville making temporary storage for students during summer breaks possible. Easy contract action and did everything by phone and email. Rented a non A/C 10 X 15 unit. Great site, thanks. Excellent, clean facility. Management was terrific in accommodating our needs and was there to help when we had a problem getting an overstuffed unit open. They were able to do almost everything over the phone and through the mail which made for a great experience. Could have used a bigger unit, but timing is everything. Marsha is wonderful. Very polite and helpful. Excellent service. Clean facility!! Every document was mailed to us promptly since we were in town for very short time and in hurry. No glitches. Great place thx!! Climate Control is great! Good Services from Employees! I had two different storage units. One was a Climate control unit. it was Great. The staff were very pleasant and great to work with. When I needed something they were quick to provide. They also made suggestions that saved me money! This is an excellent Storage Facility! Friendly, helpful staff and a clean, secure facility, very conveniently located. It doesn't get any better. Thanks, Marsha! We used this facility for the first six months of 2016. Arrangements were handled long distance with absolutely no hitches by the very prompt and helpful Marsha. On the day of arrival, the moving truck was allowed to unload while paperwork was completed. Staff was efficient and courteous. Storage unit was immaculate, climate controlled, and secure. Highly recommended. The facility is exceptionally clean and well-maintained. The staff is prompt, friendly, and knowledgeable. I looked at several facilities before finding this one, and it's the best across the board by far! I would not go anywhere else for my storage needs in the future. Many times we have experiences that really turn out great and we need to share them. So it was with Crozet Self Storage. The unit was clean, the personnel, always on top of everything when needed and just a pleasure doing business with them. Fabulous facility and really wonderful customer service! The climate controlled unit was clean, well maintained, and security was perfect. The overall facility is planned out nicely to make maneuvering larger vehicles and towing equipment easy for those of us not used to operating this type of equipment daily. Everyone I spoke with and worked with was very helpful, not pushy in looking to up-sell me but concerned about making sure I had the right unit to fit my needs and necessary materials to make my move and storage of my possessions easy and secure. I would recommend this facility, and would consider them again should I need storage in the future. Very clean, secure storage facility. Marsha is awesome and very prompt with any questions or concerns. Just closed out a 20 x 20 unit and currently in a 10 x 10 climate controlled unit. Very pleased with the quality of customer service, secure and cleanliness of storage buildings. Marsha was great when I called desperate for a unit for our UVA student. She answered all my questions since it had been awhile since we had rented anything. We'll be back and will recommend to others when in need of storage. Drive was not bad from Cville at all. I've rented storage space 4-5 times over a period of several years and have always found that doing business with CSS@Crozet is very professional. Charlottesville Self Storage at Crozet is tops! Thanks for the great service! With your friendly and very helpful staff, clean and easily accessible facilities, Charlottesville Self Storage at Crozet is definitely tops in the storage industry! Very nice owners and clean facility. Easy access and not too expensive. I have rented here twice. Staff have been great each time. If I ever need storage again, I will choose them. Everything about this storage facility is top notch. The facilities are pristine: clean, dry, well-lit and totally secure storage. The owners are great, too. The rental terms, pricing, and payment took only minutes. And the owners were available and incredibly accommodating one night after hours, when we had a minor emergency. Highly recommended. Moving and needed storage fast. Charlottesville Self Storage at Crozet met every need. Easy entry, safe, and items secure. Very nice facility to deal with, leaft nothing to be desired! clean, safe and reasonably priced! We had a storage unit here for over a year. It was always clean, well lit and safe. Prices are reasonable and the staff couldn't be more friendly. We would rent a unit again without hesitation. Wonderful staff, and the storage unit was very clean and easy to access. I used Charlottesville Self Storage at Crozet for 2.5 years. All of my belongings came out as nicely as they were when I stored them. The staff is excellent and the facility is super clean and very secure. The price is very comparable to other places, but you get a much better feeling about the security and care the staff provides. I would highly recommend this location for your storage needs. I have used CSS@Crozet climate controlled storage more than once and been satisfied each time. Doing business has always been pleasant and efficient. Clean and secure, manager is friendly. Reasonable rates, ask for the web discount. Won't raise your rates for the first year - amazingly other places around town will after a few months.